Garden celery, Knob Celery, Wild Celery, Apio, Apiumgraveolens, Ajamoda, Ajmoda, Celery Fruit, Ajwan, ApiiFrutus, Apio, Fruit de Celeri, Apiumgraveolens, Céleri, Celery Fruit,Smallage,Graine de Céleri, Karmauli, Persil des Marais,Selleriefruchte, Selleriesamen. 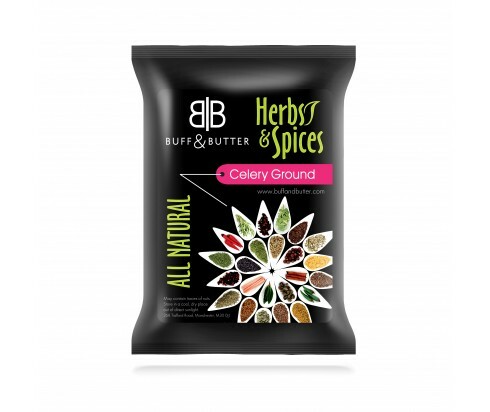 The celery seeds are light brown in colour and pack apowerful flavour tone. They taste like concentrated celery, natural and lush with a slight intense edge. Celery seeds are used as a part of vegetable dishes and sauces. Celery gives these dishes a touch of celery flavour with the addition of a couple seeds. Celery seed is regularly used as a part of pickles,chutneys and mustard, on homemadebiscuits. For decoration and flavour homemade bread. For strongly enhanced fish, celery seeds can make a delicious addition to the marinade or poaching sauce. Celery seed can be used as a part of teas and soups. It can be found in as a concentrate in supplement form. Celery seed is used to treat colds, influenza, poor digestion, water maintenance, arthritis, and certain maladies of the liver and spleen. Also, Celery seed is used as a diuretic, which means it helps your body dispose of water by expanding urine output. Celery is used for calming the nerves. Helps lowering the blood pressure. Celery is a healthy medicinal food, frequently used to decrease the requirement for salt in cooking. Scientists have not studied celery seeds in kids, so it is not suggested for use in kids under 18. The celery plant stands around 60cm to 1m in height. It has 3 to 5 sectioned leaves and flowers with white petals. Celery seeds, found in the flowers, are small, tan to dark brown and have a strong smell.